Ciego de Avila’s 20-0 “super knockout” thrashing of Granma in last night’s Oriental League opening semifinals contest was hardly very gripping or even faintly artistic. But it certainly was a game that put several dents in the professional baseball record books. The lopsided “laugher” surpassed anything in the way of previous post-season romps found in big league annals, and it even managed to outstrip (if only on a few technicalities) all similar games in Cuban League history. Surprisingly it was not, however, the most one-sided shutout in five decades of Cuban League action, or even the biggest romp in the quarter-century-plus of National Series playoff rounds. Yet it was the first one-sided affair that was stopped as a super-sized “mercy killing” after only four-plus innings of relentless home club onslaught. Yoelvis Fiss powered Ciego’s record-breaking 20-0 playoff romp with a double, triple and homer. To the delight of a dizzy home crowd of 10,000-plus in nearly packed José Ramon Cepero Stadium, the unprecedented game was all-but-over about halfway through the home club part of the first inning. The first four Tigers to stride to the plate all singled, the inning’s first out was recorded on a run-producing sacrifice fly hit by the fifth batter in the order, and the first ten home club players either reached base or produced a run-batted home. By contrast, Tigers manager Roger Machado’s ace starter, Vladimir Garcia, yielded a lead-off single to Granma’s Ramón Tamayo and then retired eight straight before allowing a base on balls (again to Tamayo). For the night Garcia surrendered only two tame singles and two free passes and will now be well rested for perhaps two additional starts (if needed) in this still-very-much-alive and crucial semifinals series. For those who may not be fans or followers of Cuban League play a few explanations are likely in order to clarify the discussion that follows. Cuba has long played with the 10-run and 15-run “mercy rules” that cut short one-sided contests and are a staple of international tournament baseball. While post-season play in Cuba abandons the novel and controversial extra-inning “tie-breaker conditions” that are also employed in such international events as the Baseball World Cup, Olympic baseball, and even the MLB World Baseball Classic, Cuban playoff games do maintain the “mercy rule” conditions. If a team leads a game by 10-plus runs at the conclusion of seven innings (6½ innings if the home club is in the lead), the game is considered a KO victory and action is suspended. If the margin is 15 or more after five frames (4½ with the home team up, as was the case last night in Ciego), then the game is also ended and goes into the record books as a “Super KO” victory. Major League Baseball—despite its many tradition-killing innovations such as DH batters, plastic turf, indoor ballparks, and video replays—has not yet joined the modern baseball world with either a KO condition or a “tie-breaker” scenario. And of course since MLB contests are now high-production commercial spectacles—designed in large part to lure “consumer fans” into “shopping mall venues” to purchase beer, foodstuffs and a plethora of tee-shirts and caps and all manner of other memorabilia—we would hardly expect to find changes that might curtail the length of such a lucrative marketing enterprise. But Cuban ball games are the product of a very different-style entertainment universe. If yesterday’s shortened 20-0 game was not actually the most lopsided in island baseball annals, the game nonetheless can now claim unique status. Only four years back Pinar del Río blitzed proud Industriales 24-0 in a quarterfinal round lid lifter and that earlier contest remains the league’s most one-sided post-season affair. But since Pinar had not stretched its advantage to as many as 15 runs but the end of the fifth, the game had to continue on through the seventh. It was thus a record-busting KO but not a “Super KO” game. Last night’s match is now the first Cuban League playoff game to claim that distinction. The March 2008 Pinar-Industriales blowout contest also supplanted an earlier 21-0 Villa Clara win over Holguín (during regular-season National Series action on January 20, 1995) as the widest margin in a league shutout game. But the Villa Clara win was also achieved in seven innings as a KO but not a Super KO. The Ciego whitewash also surpasses big-league standards for most single-team runs in a World Series (18, by the New York Yankees in 1936), most runs by a winner in an MLB playoff contest (19, also by the Yankees in 2004), and widest shutout margin in a big-league post-season game (15-0, by Atlanta in 1996). This game, played at Capitán San Luis Stadium in Pinar, provided the widest margin for a post-season Cuban League KO game but was nonetheless not a 5-inning “Super” Knockout. Pedro Luis Lazo was the winning pitcher (career victory 237) and Ian Rendón started for Industriales. Pinar hit 7 homers, two each by Yosvany Pereza, Tomás Valido and Donald Duarte. Bill Dickey and Tony Lazzeri homered for the Yankees and the Giants used five pitchers. Giants’ starter Hal Schumacher lasted into the third inning, when the Yankees scored 7 runs. The Yanks added 6 more in the ninth. This game was tied 6-6 when the Yankees blew it open with 5 runs in the fourth, then later added 4 tallies in the seventh. Yankee batters slugged four homers (two by Hideki Matsui) but Boston also hit three. The combined 37 hits and 20 extra-base hits were also MLB post-season records. This game was not actually a lopsided blowout but instead a slugfest by both clubs. Atlanta scored 6 times in the first frame off starter Donovan Osborne and added four more in the fourth. Javy López, Andruw Jones and Fred McGriff all homered for Atlanta. Ironically this game broke a record set only two games earlier (October 14, NLCS Game 5) when the Braves won 14-0 on the strength of 5 first-inning tallies and a 22-hit attack. Cardinals’ starter Todd Stottlemyre was knocked out in the first inning of that earlier game. In their final at-bat in the fourth Ciego was finally shut down without a single run, although Yoelvis Fiss did reach base on a double to left (giving him four-fifths of a “super cycle” with a homer, triple, double and walk). One interesting footnote here is that the Tigers sent 14 men to the plate in the first inning while Ciego starter García faced only 19 Granma batters in the entire game (only five innings, of course, with 15 Stallions making outs, two receiving bases on balls, and two reaching on base hits). This has to be one of the few games in pro baseball history in which one team registered only five less at-bats in the opening frame than their opponent did for the entire contest. Baseball is indeed the most unpredictable of sports and what happens one day is never a good indicator of what might happen a day later. Team Cuba was slaughtered 12-2 in their laughable first match with Puerto Rico in the initial World Baseball Classic and yet bounced back a handful of days later to win a rematch and thus reach the WBC final round in San Diego. After their 18-4 Game 2 romp over the cross-town Giants in the 1936 World Series, the Yankees squeaked out a 2-1 victory a day later and needed 6 games to capture the tight series. 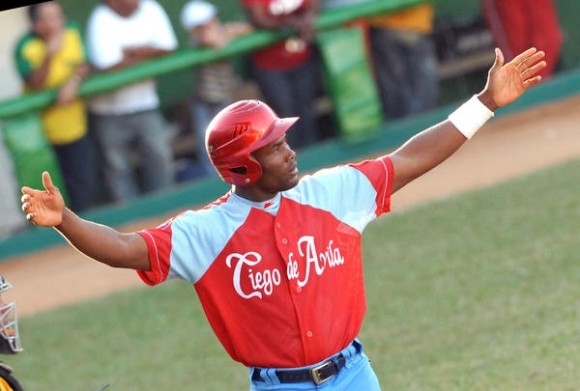 Pinar del Río did indeed sweep their three-game quarterfinals series from Havana Industriales in 2008 but won the final two close matches by only a single tally in each. So it now remains to be seen what transpires between Ciego and Granma over the next several days. Most pundits have already picked Machado’s Ciego club on the basis of a more balanced Tigers lineup, overall shoddy Granma pitching (especially relief pitching) and lame defense, and the presence of strong-armed Ciego ace Vladimir García. García didn’t need to break a sweat in the opener and now has plenty of innings left in his arm for the remainder of the series. But it is Granma (despite last night’s scoreboard) that owns the more hefty offense and we would be wise to expect a good deal of future noise from the recently embarrassed Stallions. Don’t assume this series is over quite yet.